Update for 2012: It’s Christmas Concert Day once again, and so I am reposting this, grateful for all the people who have inspired me along the way to this crazy career. I have a skirt I wear every year, on Christmas Concert Day. Wool, A-line, bias-cut. Simple, almost old fashioned. It hits just below my knee. It’s plaid, mostly dark green and navy blue, with a bright line of red criss-crossing over. With a ruffly white blouse and a red cardigan, it makes me feel festive without descending into the dangerous territory of Christmas sweaters. But that is not the real reason I wear this skirt. The plaid happens to be my family’s tartan, and while we don’t identify particularly strongly with my Scottish heritage (the circus folk and Swedish royalty being far more interesting), I do like having a tartan to call my own. But that is not the reason I wear this skirt, either. The fabric is the real deal, bought in Scotland by my Auntie Billie, sewn into a skirt for her by my grandma. And THAT is, sort of, the reason I wear this skirt. My Auntie Billie was my dad’s oldest (but not older) sister, and the mother of my favourite cousin. She was a tiny lady, with a great big laugh. I spent most of my childhood hearing how very much I looked like my Auntie Billie when she was a little girl, and the comparison delighted me. 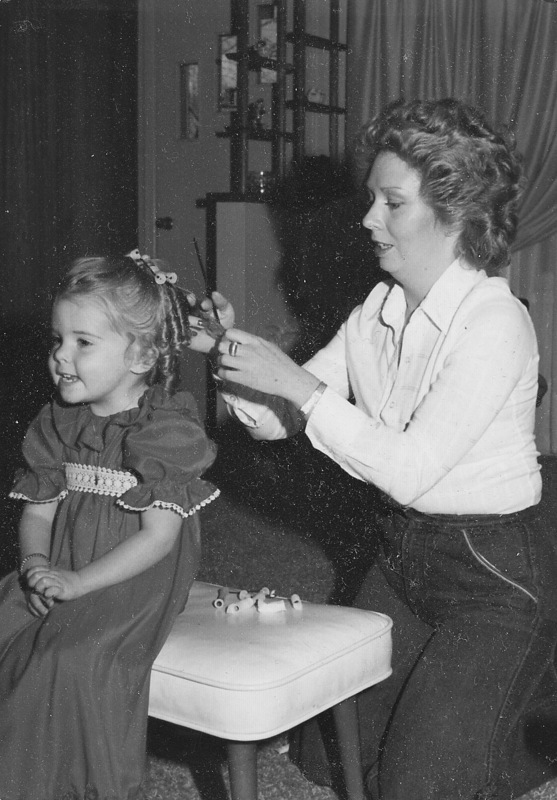 Her first career was as a hairdresser. She gave me my first haircut (and also my first perm, but I have long since forgiven her for that). My favourite photo of her shows her bent over my three-year-old head, creating tiny ringlets for my very important job as a flower girl in my other Auntie’s wedding. I remember that day, sitting on the ottoman in my grandma’s living room, Auntie Billie’s fingers gentle in my hair, the sound of her laughing with her soon-to-be-wed younger sister. Later, at the wedding itself, I was suddenly too shy to walk down that very long aisle under the gaze of all those people. Auntie Billie, the maid of honour, came back down the aisle, and took my hand. We walked together to the front of the church. Auntie Billie’s second career, and true calling, was as a teacher. At first, she taught high school beauty culture, but it wasn’t long until she found her niche with first and second graders at a high-needs school. Eventually, she became a vice-principal, helping to create an innovative year-round school program, the first of its kind in our city. She was a force to be reckoned with: passionate, articulate, stubborn, and oh-so-very funny. You can see why comparisons to her continue to delight me. The year I met the first group of kids to call me “teacher,” Auntie Billie lost a seven-year battle with breast cancer. I didn’t know, yet, that my own career path would wind its way ever-closer to hers, and that, at every milestone, her absence would sting a little more sharply. As I started grad school, and began thinking and learning about children and families in a whole new way, I wished for her to sit next to me when I came home for holidays, and help me make practical sense of the dense research papers I was reading. When I got my first job teaching in a school (as opposed to a child development centre, rec centre, or community service agency), I wished for her to help me figure out the logistical realities of teaching two grades in one room, and the slippery alchemy of Teaching Children to Read. When I found myself at an unexpected professional crossroads, deciding between a job I didn’t want, in a school community I loved; and a new, scary, dream job at a strange new school, I wished for her counsel (I took the dream job, and I’m sure Auntie Billie would approve.) Now, as I struggle every day to balance my students’ day-to-day needs with the ever-increasing list of exciting-but-demanding additional responsibilities I seem to have taken on, I wish for her more than ever. I wish for her to hold my hand as I dance this dance, and walk this path. At 22, I cried for the loss of my beloved Auntie. A dozen years later, I cry for the mentor and cheerleader I know she would have been. It continues to surprise me, this grief that gets sharper, instead of smoother, over time. I know she is with me, and I find ways to keep her close. A photo of her with her hands tweaking my tiny ringlets sits on my desk at home. The dedication page of my Master’s thesis lists her name. Nearly every day, I wear a small gold heart on a chain around my neck, a gift from her younger sister, to her, and back to me upon completion of grad school. Occasionally, I run into old friends of hers, or my dad’s, and the first thing they do is gasp at how much I am like my Auntie Billie. I hear her laugh coming out of my mouth when I tell my best teaching stories. I know she is proud, and in case I ever forget it, her siblings — my dad and my godmother — remind me of that on a regular basis. But still, I wish she were here, and I wish that the hardest on the days I am most proud: of myself, and my students. And so, on concert day, I wear Auntie Billie’s skirt. I am not as tiny as she was, and so it has to sit high on my waist. The blouse and cardigan help cover this adjustment. As I kneel on the gym floor, helping 20 five-year-olds to remember the words and the steps, I’m pretty sure Auntie Billie is kneeling next to me. I wear her skirt, and I laugh her laugh, and I cry her tears of pride, and I hope that just maybe, when my students take my hand, they feel the love of her hands, too. I love your writing always so moving. Now that Im heading off to school all teary, Conferences and Concert rehearsal, I am in the right frame to appreciate the important things! By now, I should know better than to read your blog sitting at my desk at work, where I am now wiping tears from my face after reading this beautiful tribute to your aunt. In this season that seems so focused on material gifts, thank you for reminding us of the powerful gifts of love, belief and kindness. OK, just found this and I love it…. I too have been touched by so many mentor-figures in my life and career, and I love finding opportunities (like skirts) to honour their contributions to my life. Well done. Amy! I just found this post and I am now sitting here all teared up! Sniffle! This is a beautiful story. Thanks for sharing. This story has the best of so many things — memoir, reflection, and holidays. Love, love, love. Thanks for sharing that. I think every teacher has someone who has inspired them- whether they knew it at the time or whether they look back and realize they followed a path that was guided by that person's experiences. I think your Aunt sounds exceptional. I'm sure she is looking down and proud of the legacy that you are carrying on! Happy New Year. I understand completely. I feel the same way about the loss of my mother, who was my mentor and guide in both parenting and teaching. Sometimes, no matter how long ago it was that you lost that special person, the pain of it is such a sharp ache that it brings you to the verge of tears. 24 years and counting for me. Hugs to you.